You are buying the Pilairo Q Nasal Pillows Mask With No Headgear 400HC565 CPAP, manufactured by Fisher & Paykel. Fisher & Paykel is a leading manufacturer of CPAP Masks and accessories. At ADW Diabetes, we offer the complete product line by Fisher & Paykel with great savings and excellent service. You are buying the Pilairo Q Nasal Pillows Mask With No Headgear 400HC565 CPAP, manufactured by Fisher and Paykel. 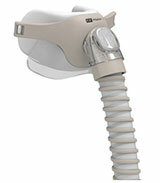 Fisher and Paykel is a leading manufacturer of CPAP Masks and accessories. At ADW Diabetes, we offer the complete product line by Fisher and Paykel with great savings and excellent service. The Pilairo Q Nasal Pillows Mask With No Headgear 400HC565 CPAP is a ultra quiet nasal pillow CPAP mask from Fisher and Paykel. The air pillow seal allows for an advanced freedom of movement during CPAP therapy as the seal will not break even for more frequent movers.